These bikes look like antiques but they're actually brand new. And they're really good. A lot of those nice looking old motorcycles you see on the roads may not be very old at all. Some of the coolest new bikes on the road today look like they came off the production line decades ago. 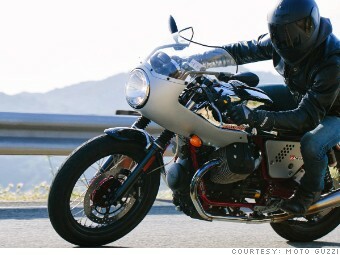 We asked Wes Siler, editor of the motorcycle Web site RideApart.com to tell us about a few of his favorite retro bikes. For instance, that's Wes above -- or at least he says it is, and we believe him -- riding the Moto Guzzi Racer V7. It's a replica of the one of the Italian bike maker's '70s track bikes. That huge windscreen helps make it comfortable for long distance rides, said Siler.